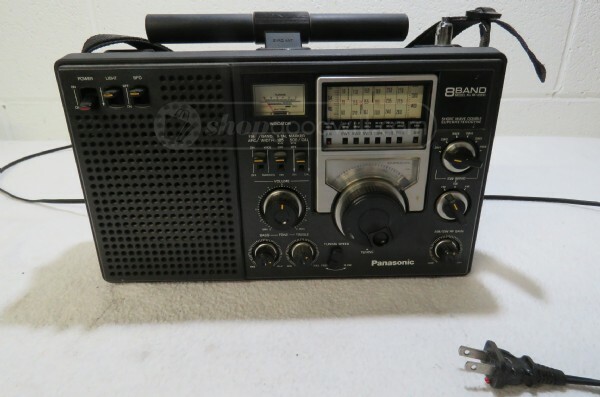 Many thanks to SWLing Post contributor, Mario Filippi (N2HUN) who shares a link to this National Panasonic RF-2200 on ShopGoodwill. The bid is currently $78 and ends this evening. 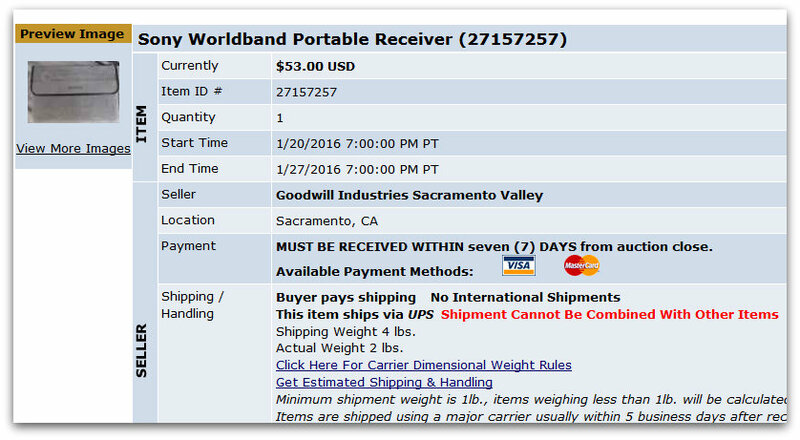 You must be registered with ShopGoodwill and have a PayPal account to place a bid. Note that I’ve had some very good luck in the past with ShopGoodwill, but buying from them is more akin to buying from a flea market than, say, eBay. Almost always items are sold as-is, no returns, have mediocre low resolution product photos, and are not properly tested. 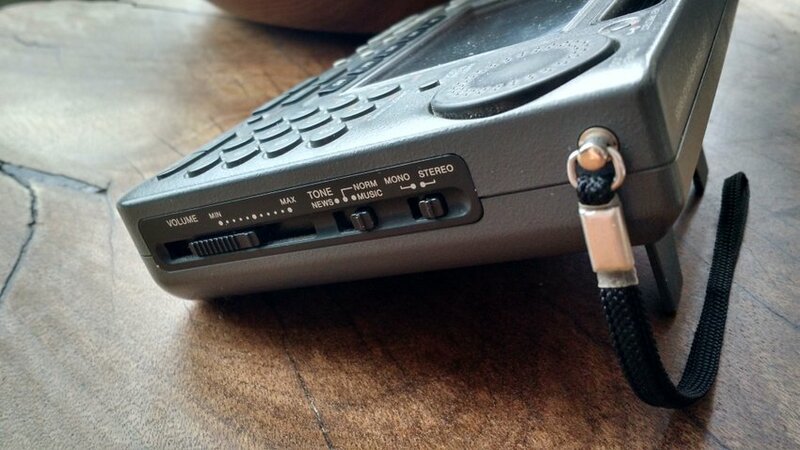 In the case of this RF-2200, it appears the Goodwill employee turned on the radio and tuned the FM band which worked fine. If you’re willing to take the risk, though, you can often snag great deals on ShopGoodwill. 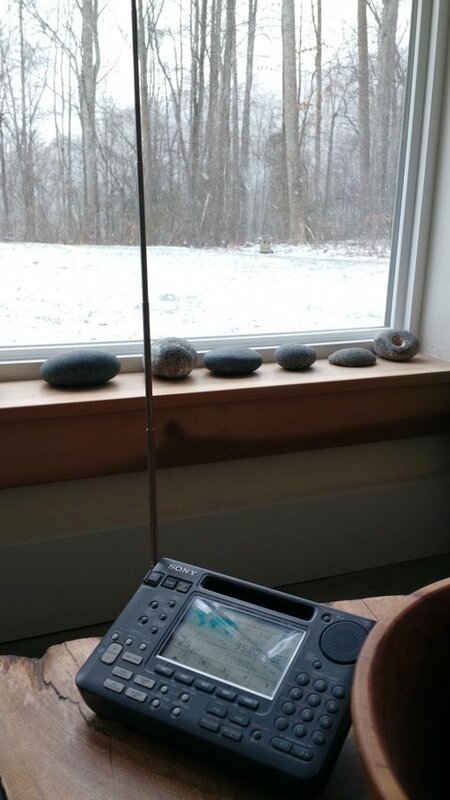 This entry was posted in News, Radios, Shortwave Radio, Vintage Radio and tagged Mario Filippi (N2HUN), Panasonic RF-2200, RF-2200, ShopGoodwill on March 30, 2017 by Thomas. Thanks for the tip, Mario! As with most (if not all) ShopGoodwill.com auctions, this IC-R75 come with no warranty, is untested and sold “as-is.” I suppose you could receive it only to find that it doesn’t function–that is the risk with Goodwill over, say, eBay. I’ve purchased from ShopGoodwill before knowing this and was very pleased my item worked. Still, it’s most encouraging that the receiver comes complete with box, manual and power supply. Those are all good signs. The current price is $378.78 at time of posting. Someone may get a good deal for a spare receiver. 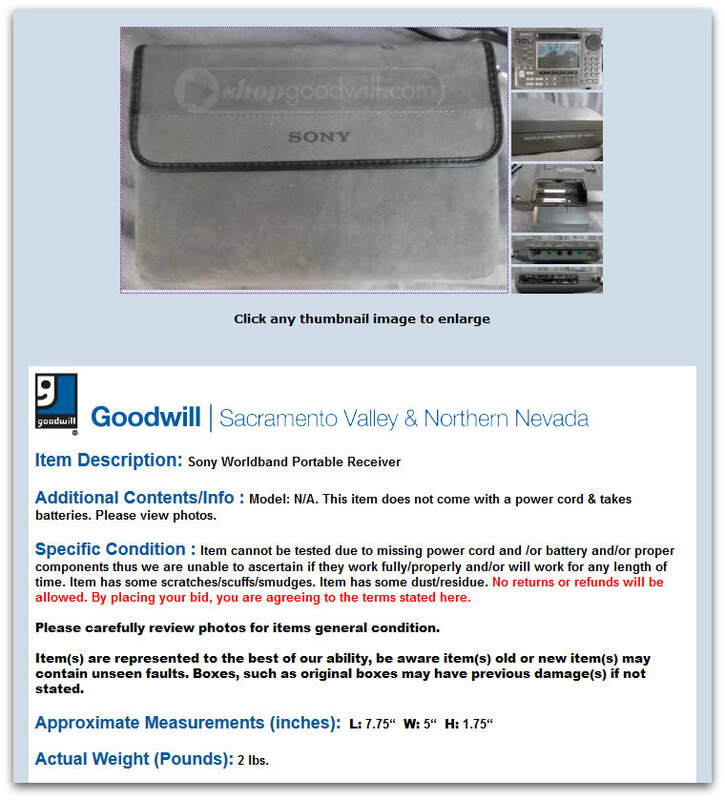 While looking at the IC-R75 listing, the ShopGoodwill screen also pointed out a JRC NRD-525 with an auction end date of November 29. Again, thanks for the tip, Mario! This entry was posted in Deals, News, Shortwave Radio, Vintage Radio and tagged Deals, Icom IC-R75, JRC NRD-525, Mario Filippi (N2HUN), Radio Deals, ShopGoodwill on November 27, 2016 by Thomas. Regular SWLing Post readers know that I’m a sucker for classic solid-state portables and vintage tube radios. What many of you may not know, however, is that I’m not a fan of auction-style bidding for radios. Those who are familiar with it will recognize the story: it begins on an optimistic note, when I find something I’m enthusiastic about. Then the bidding war begins, and invariably, the price quickly ratchets upwards to far beyond my comfort zone. It’s only then I find I’ve wasted my time on the entire process, and my hopes are dashed. So it’s not a purchasing method I relish. 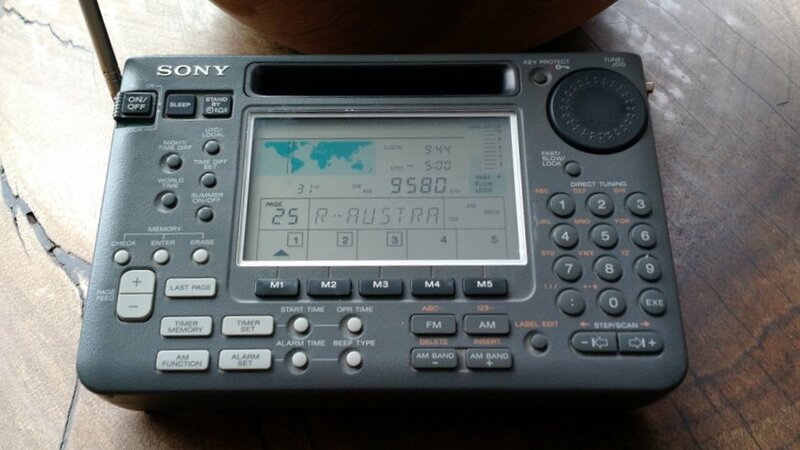 Therefore, despite all of the radio gear I’ve purchased over the years, I’ve only bid for a radio in an online auction perhaps three or four times. 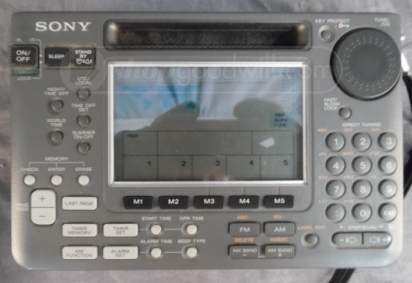 But a couple of weeks ago, my buddy David Korchin (K2WNW)––who has a knack for finding deals on radios, and often alerts me to them––mentioned that he was bidding on a Sony ICF-SW55. Photo of the ICF-SW55 from auction listing. David wasn’t bidding on the popular online auction eBay––rather, he’d found this deal on ShopGoodwill.com. 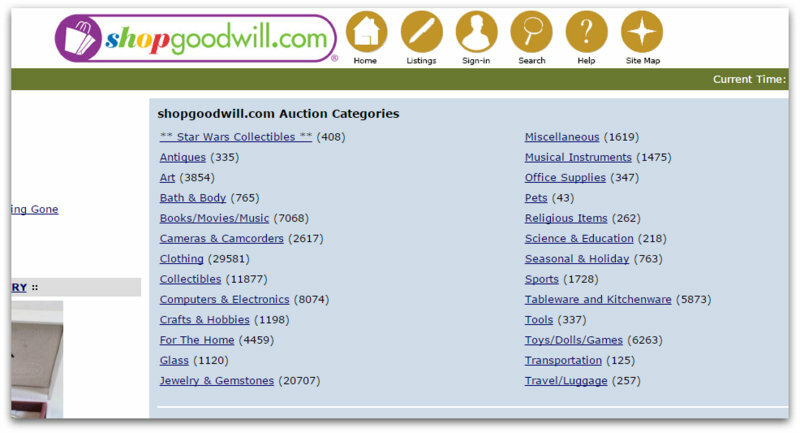 In case you haven’t heard, ShopGoodwill.com is Goodwill Industries International’s online auction site. Goodwill employees select exceptional donations, items they feel are worth more than typical Goodwill retail prices, and post them there for online auction. I believe it was SWLing Post contributor, Mario Filippi, who first introduced me to ShopGoodwill. The cool thing about ShopGoodwill is that it’s not as popular as, for example, eBay. Thus a bidder has a better chance of finding a good deal, with the added benefit that less enthusiasts will be hiking up the price with rapid bidding. So, in summary: unless otherwise specified in the listing, you must assume that any item offered for auction on this site doesn’t function and may be in poor cosmetic condition as well. After all, these are donated items. With that said, even though the risk is higher than on eBay–where sellers are rewarded with positive feedback and endeavor to fully describe merchandise––some good deals are occasionally to be found on ShopGoodwill! 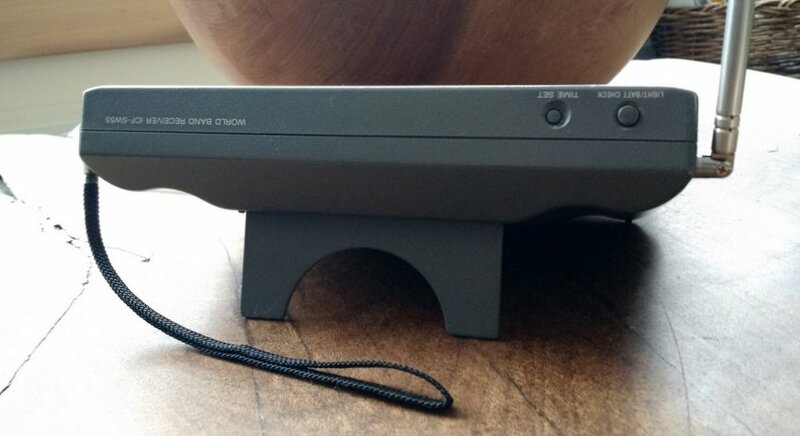 The Sony ICF-SW55 listing that David found on ShopGoodwill.com kept a steady bid of $28 until the day before the auction’s end, when it increased to $48 US. 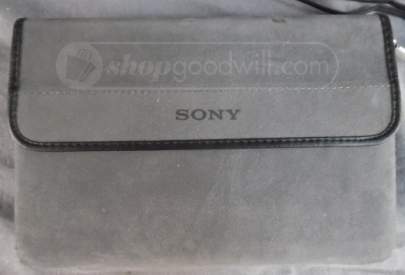 It’s likely that this listing would have seen more active bidding if the description were better––it didn’t even provide the model number, and was listed as “Sony Worldband Portable Receiver.” Moreover, the feature photo for the listing was of the radio’s case, not the radio itself (see below), yet another reason the listing got so little attention. But David, being the deal hound he is, found it! I encouraged David to really go for it, saying that this could be an excellent opportunity to snag one of these classic portables for a good price. And if it didn’t work, there would be a good chance Vlado could fix it for a fair price. The morning the auction concluded, David messaged me that he’d decided to pull out of the bidding. He found something else he wanted to snag, so he encouraged me to take the baton and bid on the ICF-SW55, myself. I read the vague description…then took a deep breath, and decided to go for it! Wait until the last few seconds, then offer my highest comfortable bid. I waited until one minute before auction end. I decided I would go as high as $120––a little rich for my modest budget, considering this could amount to a parts radio, but it was late in the day and I admit I wasn’t thinking clearly. Then, at thirty seconds before auction’s end, the ShopGoodwill.com site simply stopped responding––! No, it wasn’t my dubious Internet connection this time––their site was having problems loading. I finally got the auction screen to pop back up ten seconds before auction’s end. I quickly attempted to place my bid: the web page churned…and churned…and churned. Finally, up popped the review screen at literally the last breath of a second. I clicked “confirm/submit” (thank you, LastPass, for filling in my password immediately) and just managed to record the bid! The Goodwill site was having so many problems, that it took it two full minutes before I could get the auction screen to refresh after it accepted my bid––it was still stuck on the screen that confirmed my bid was recorded and that I was––for the moment, anyhow––the highest bidder. When the page finally loaded, I saw that I had, by the skin of my teeth, snagged the SW55, and for a mere $53. 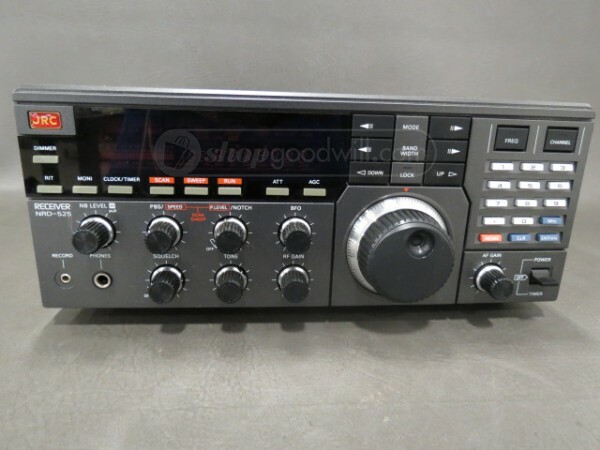 That is one of the lowest prices I’ve ever seen one of these units go for in an online auction, even when listed as a “parts-only” radio. Needless to say, I was exhilarated! My heart pounded. I’m certain that the problem with the Goodwill site helped me win the auction. There were multiple bidders, and I think mine just happened to trigger a bid, leaving the competition no way to outbid me in the last 1/10 of a second. This wasn’t bidding skill. And it surely wasn’t a fat wallet. Frankly, I was just lucky. I was thrilled to have won the radio at such a relatively low price, but the relief afterward reminded me why I don’t like auctions like this. I definitely prefer a more straightforward, less exciting (and less anxiety-producing), approach to making purchases. Goodwill can be relatively slow to ship. It took about two weeks, but on Monday, I received the package from Goodwill in California. The rig, save a little dust, looked fine. But…how would it function? I put in some freshly-charged Enloop AA batteries and turned it on. Much to my surprise, the rig turned on…I rapidly tested all the functions. Again, I couldn’t believe my luck: it functions perfectly! The only feature in need attention is the DX/Normal/Local switch, which makes the rig sound a bit scratchy when I change positions––an easy fix, however, with the aid of a little DeOxit. 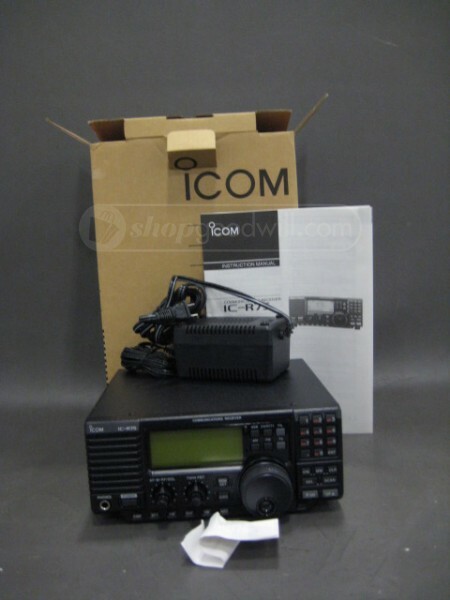 This auction had a happy ending: I got a radio I’ve always wanted for a price I could swing, I didn’t need my friend Vlado to come to my rescue (though I’ve no doubt he would have), and best of all, I find I absolutely love the ICF-SW55. Stay tuned…A review of the classic SW55 is in the works, and will be here on the SWLing Post in the coming weeks! 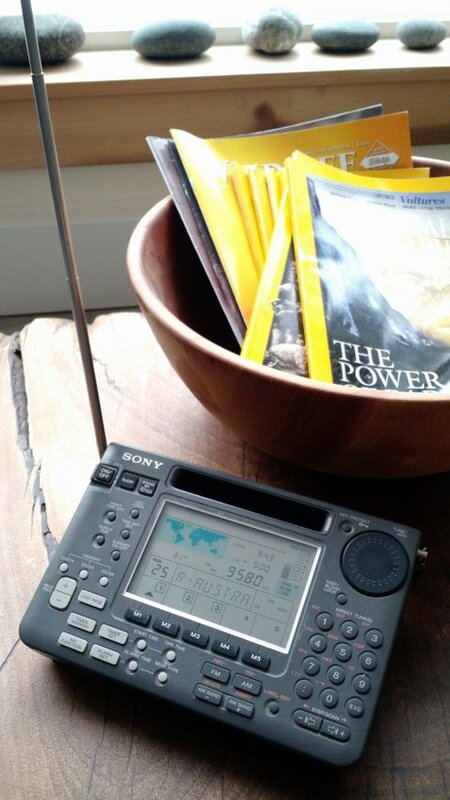 This entry was posted in Deals, How To, News, Portable Radio, Radios, Shortwave Radio and tagged David Korchin, David Korchin KC2WNW, eBay, Goodwill, ICF-SW55, Online Auctions, ShopGoodwill, Sony, Sony ICF-SW55 on February 12, 2016 by Thomas.